We've included these beaches for you: Gnarabup Beach and Cowaramup Bay. You'll discover tucked-away gems like Bunker Bay and Hamelin Bay Jetty. Explore Margaret River's surroundings by going to Dunsborough (Dolphin & Whale Watching & Meelup Beach) and Yallingup (Yallingup Beach & Canal Rocks). There's much more to do: learn about winemaking at Redgate Wines, look for all kinds of wild species at Sunflowers Animal Farm, take a memorable drive along Caves Road, and enjoy the sand and surf at Hamelin Bay. To see traveler tips, other places to visit, ratings, and tourist information, read Margaret River trip itinerary app . New York City, USA to Margaret River is an approximately 33-hour combination of flight and bus. You can also do a combination of bus and flight; or do a combination of train, flight, and bus. The time zone difference moving from Eastern Standard Time to Australian Western Standard Time is 13 hours. Finish your sightseeing early on the 29th (Thu) to allow enough time to drive to Albany. Visit Cheynes Beach and Cosy Corner Beach for some beach relaxation. Get some historical perspective at The Church of Saint John the Evangelist and Point King Lighthouse. The adventure continues: enjoy the sand and surf at Little Beach, stroll through Middleton Beach, pause for some photo ops at Desert Mounted Corps Memorial, and take in the exciting artwork at Torbay Glass Studio. Take the guesswork out of planning a Albany vacation by using our trip itinerary maker. Getting from Margaret River to Albany by car takes about 4.5 hours. Other options: take a bus; or do a combination of bus and flight. In November, daily temperatures in Albany can reach 71°F, while at night they dip to 51°F. 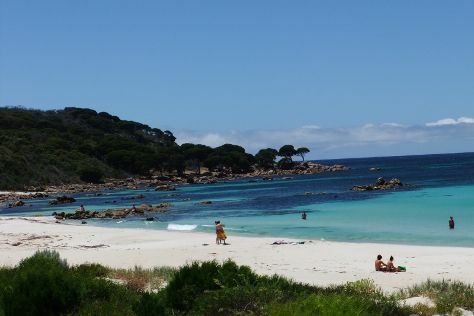 Cap off your sightseeing on the 2nd (Sun) early enough to go by car to Esperance. Esperance is a town in the Goldfields-Esperance region of Western Australia, on the Southern Ocean coastline approximately 720km east-southeast of the state capital, Perth. Your itinerary includes some good beach time at Ten Mile Lagoon and Thistle Cove. Kids will enjoy Salmon Beach and Blue Haven Beach. There's much more to do: enjoy the sand and surf at Hellfire Bay, stroll through Lucky Bay, sample the tasty concoctions at Lucky Bay Brewing, and browse the exhibits of Section Glass Gallery. For reviews, where to stay, traveler tips, and tourist information, read Esperance trip itinerary site . Traveling by car from Albany to Esperance takes 5 hours. Alternatively, you can fly; or take a bus. December in Esperance sees daily highs of 78°F and lows of 56°F at night. Wrap up your sightseeing on the 7th (Fri) to allow time to travel back home.